We left Carloforte at mid-day on Monday, after meeting up with Jeff for coffee and to say goodbye. 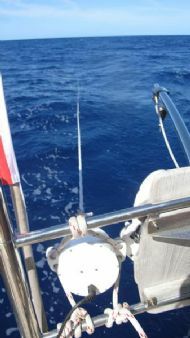 With a head wind we motorsailed round the south of the island before headinsetting the sails for a north westly passage. We had downloaded a 7 day GRIB file for the area we were planning to sail in as well as a 24 hour forecast for our estimated position over five days from Buoy weather. Taking both into account our passage plan was to head north west towards the Balearics, turning west for a time before heading south west towards the Straits, then west again to Gibraltar. This would allow us the best use of the northly, northeasterly and easterly winds predicted over our estimated 7 day journey. During the afternoon on day one we put the Hydrovane on and engaged gear. It should have given us self-steering but unfortunately we couldn’t get it to balance properly so had to give up. We also launched the Aqua-gen that Menno and Jane in Cromarty had lent us. This is an amazing piece of kit which generated anything between 3 and 6 amps of electricity consistently (as long as the boat was moving). We towed it behind us at all times, except when the engine was on. It generated enough to keep the batteries full with fridge, navigation lights, chart plotter and instruments and cabin lights all going at the same time. Thank you Jane and Menno! By mid-day on the second day we had a knot of current against us with one knot of wind so the engine went on with the main sail up for stability. We were both feeling a little worse for wear but managing to keep the Mal de Mere at bay – unusually for me I was also suffering! 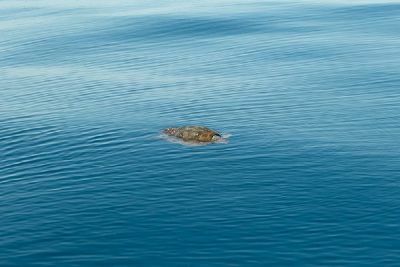 I was lifted from my misery around midnight with a sighting of a large Turtle swimming on the surface just off the port quarter. Day 3 and we were under sail on the yankee only. 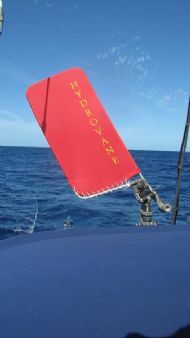 A slight course change allowed us to sail downwind so we had another attempt with the Hydrovane which was not successful. The sea was so sloppy that we had to manually steer. Our poor yacht was rocking and rolling from side to side for hours. I did wonder at one point what the foodstuffs would be like after all that mixing up! By early morning on day 4 we were surfing, at times over 8 knots, down the swell. We were visited by another turtle and a small pod of dolphins joined in the bow wave. Early afternoon saw us on the lookout after a DSC mayday message of a red flare sighting. We didn’t see anything however. By evening we had crossed the Greenwich Meridian and were now in the west! By night fall the engine was back on with again only 1 knot of wind. In the wee hours of day 5 we were passing Cartagena to starboard. A TSS (traffic separation system) meant that we had lots of traffic between us and the mainland (our first sight of land since leaving Sardinia). Just before the sky lightened we were visited by a pod of dolphins who swam with us for an hour. The spectacle was amazing – in the darkness the phosphorescence trails they left behind them were clearly visible and I could trace their underwater paths. About half an hour into their company the distinct smell of fish surrounded us and I reckon they had driven their shoal of fishy dinner towards the keel and were using us as an effective way of stopping the chase. Clever dolphins! Breakfast that day was to be fried eggs but it had to be delayed as a leak in the cabinetry was found which required tracing. It’s either the foresail track bolts which have loosened or the teak deck. A full investigation will be undertaken when we reach Gibraltar. Before we left Carloforte on Monday I had telephoned Queensway Quay Marina in Gibraltar to advise them of our arrival and book a berth. At that time they had advised the port was closed due to an oil spill but they would put our names in the diary for arrival the following Monday. After breakfast, on day 5, I telephoned on the satellite phone to confirm that we had made good progress and would now be arriving on Sunday. They advised that the Port was now open and Sunday would be fine. We had stayed with them on our trip into the Med and were looking forward to being back there. A bit later on entering log information (a routine part of our trip) I noted that the sea temperature was 23.8 degrees Celsius. That’s my kind of water temp! 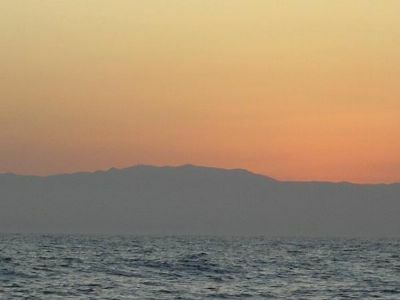 As we headed south west towards Cape Gato on the south east corner of Spain I spotted a lump in the water dead ahead. I altered our courseo avoid it and as always, curious to see what this strange lump was, had a good look over the side. As we drew closer the lump turned into a rather large Turtle floating on the surface. I cut the engine revs back and we circled it a few times. It appeared dead with its head and limbs just hanging below its shell. After a while we put the revs back on to continue on our journey. Just at that moment the turtle lifted its head, opened its eyes, looked straight at us and dived deep – looking ever so disgusted with us at waking it. I was so pleased it wasn’t dead though as that would have been very sad. By this time the current and wind had turned against us – it felt like we were going no-where although the chart showed that we were making slow progress, so we upped the revs to 1500 in an attempt to make some progress. Just after midnight we rounded the Cape and immediately picked up and ½ knot beneficial current allowing us to reduce the engine revs to a mere pottering level. Mid morning on day 6 and the fog has arrived just as we were approaching the start of the TSS through the Straits of Gibraltar. We turned the radar on and got out the fog horn. I don’t believe that these huge ships would have heard our horn – but it always feels good to give it a blast! We received an updated weather report from Buoy weather through the satellite email which showed no significant winds. The fog cleared about 4 hours later leaving us back in the sunshine. 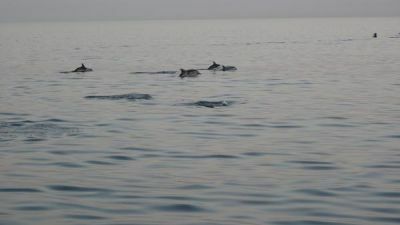 More dolphins joined us in the early evening along with a pilot whale. The current again turned against us for a short time and by the time we had eaten dinner it was back behind us pushing us along. Sunset over the Spanish mountains was spectacular. I can spend hours watching the sun set, each one is so special in its own way. Pre dawn on day 7 saw us with binoculars firmly attached to our eyes. All we could see ahead were rows and rows of orange lights. As we approached they eventually separated into individual clusters. Occasionally we could identify two red lights as well (one over the other) indicating that the ship was not in command. Closer still and the lights separated out even more, clearly becoming ships, but with no nav lights of any sort it was a bit hit and miss which direction they were facing. We passed one huge ship within 200 metres – all lights blazing, including navigation lights, but we were unable to determine if it was moving and what direction. It was at anchor! We rounded Europa point at 10am, dropped the main and motored up to the diesel pontoon to fill up before berthing at Queensway Quay Marina. A count on the AIS gave us 37 ships in the bay. None of them moving – is this a sign of recession?? A week long trip gave us a lot of time to think, sleep and read. The weather for the first couple of days was good but the sea was uncomfortable. Day 3 was calm which gave us a chance to recoup from the Mal de Mere, shower and make something nice to eat. A downwind sail was excellent but with the rock and rolling sea the boat suffered some minor effects which will require some attention. Lack of wind towards the end of the trip meant that we had to motor sail. We kept the revs low, only increasing them when the current was such that we were stopped. With the overdrive this kept our consumption of fuel to its most efficient. A count of water usage over the week was approximately 1 litre each per day with a further ½ litre of juice per day. Electricity generation was excellent with the Aqua Gen and the Solar panel. Our wind generator developed a fault, but it wouldn’t have worked anyway with no wind! On this trip we saw so much wildlife, in fact the most we have seen since leaving Portugal. The dolphins were amazing with at least two different species. The Turtles as always are so wonderful to see as were the Sunfish, Tuna, Whales and jellyfish. 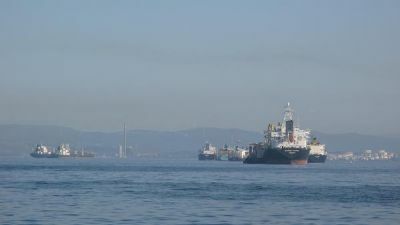 We will spend a couple of weeks in Gibraltar doing repairs, relaxing and enjoying the choices that the shops offer us here. A visit to Morrisons supermarket was like putting two children into a very large sweet shop - we had forgotten how much choice there is, along with familiar presentation of foodstuffs. How we will enjoy retrying all the different foodstuffs that we once took forgranted when we were shore based in the UK. As we climbed the Rock on our previous visit we want to see some of the other sights and took ourselves off for a walk to the Botanical Garden and Europa Point yesterday (Saturday). We were impressed with the Garden on our last visit and this time round was just as impressive. pic: The Dell in the Botanical Garden. 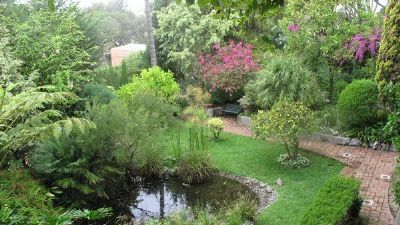 The gardens are certainly an oasis of tranquility and charm within this busy city. 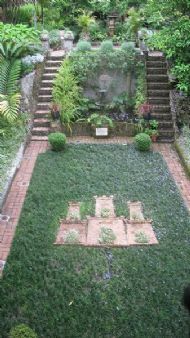 The Dell was created by the Genoese and as you can see from the picture above it has been kept in amazing condition. 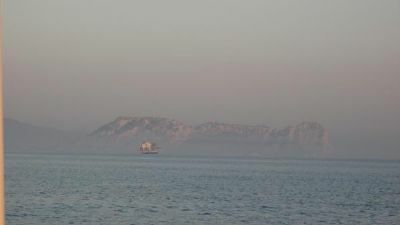 On this visit to Gib we decided to take a trip to the East side of the Rock, using public transport. It was a lovely few hours out with a nice lunch in the beach-side cafe. The east side shows its more mediterranean influence and of course as there is only one road with 2 lanes between the houses and the Rock, the apes were in abundance - looking for food. We'll be leaving Gib around the first week in July, weather permitting, and heading to Madeira but once again we have enjoyed our time here.